Tickets are now on sale they are hotter than the summer sun… so dash over to See Tickets and get yours reserved! The UKBlues Federation is once again hosting the UK Blues Challenge 2018. Once again, there will be the opportunity to hear five super blues band play. Sit back enjoy the music. There will be a panel of handpicked judges who will do the thinking and cast the votes that will select the band that will be representing the United Kingdom in USA & Europe in 2019. The event will take place on Saturday 8th September 2018 at Worthing Pier’s Southern Pavilion and more details of the event, including how you can get tickets, will be made available soon. The winner will be invited to represent the UK at the 35th International Blues Challenge in Memphis in January 2019 & 9th European Blues Challenge in Ponta Delgada in the Azores in April 2019. 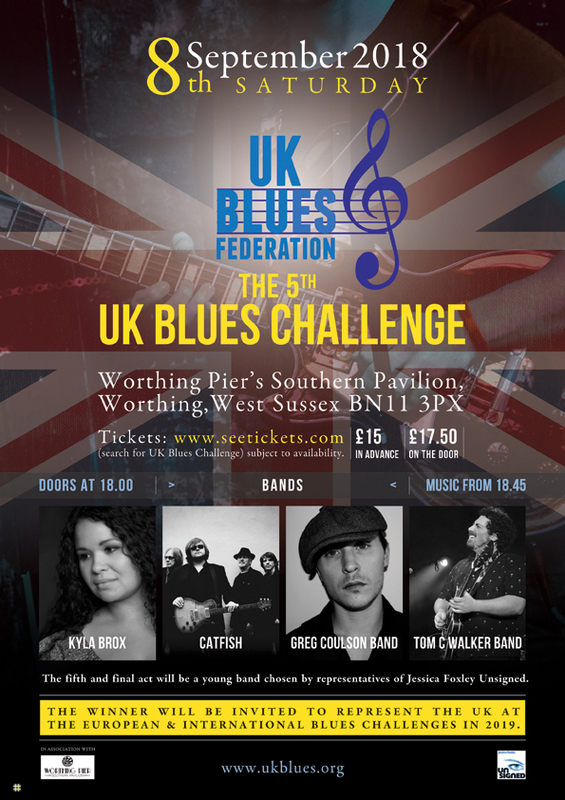 Four of the bands who had the most nominations from a panel of over 600 people have been announced for the 5th UKBlues Challenge. they are Kyla Brox, Greg Coulson Band, Tom C. Walker and Catfish. A fifth act will join them and this act will be chosen by the Jessica Foxley Unsigned Project panel from those acts appearing under the Project’s banner at this year’s Great British R’n’B Festival at Colne in late August. Four acts will be playing at Colne they are: to Carl North & The Lonely Hearts, The Catfish Blues Orchestra,Chris King Robinson and Katy Hurt, who will be on the main stages at the Great British Rhythm & Blues Festival. As soon as Bluesdoodles knows the fifth act we will let you know!